Tolles Soulalbum, bis auf 2 Titel alles sehr gut gelungen. Weil mir damals "I try" überraschenderweise so unverschämt gut gefiel und auch Nr. 1 der Uebi-Hitparade war, musste ich mir die CD natürlich zulegen. Finde die CD schön abwechslungreich, mit genügend guten Songs drauf. Gerade "Still" ist auch wirklich gut gelungen, dazu gefällt mir auch ihre spezielle Stimme. Gutes Album mit dem Überflieger 'I Try'. "I Try" ist eindeutig der radio freundlichste Track, der Rest Geschmackssache. Noch ganz okay, zur 4 aufgerundet. 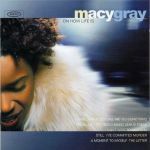 It really surprises me how big and popular Macy Gray was for this short span of time. I Try was such a big hit, I remember it being played everywhere and all of the adults seeming to like it (I was very young at the time and couldn't stand it). And now looking at it, even the album was a huge hit both in NZ and Aus. I would expect an artist with a voice like this to be a bit more polarising but for that short period she was pretty dominant and popular. The album is not so bad a listen, for one, the voice is there and the voice is not so pleasant, but the songs are generally held up with decent production and interesting stories. You get a lot less of the random yelling in the album tracks, which is appreciated. All up, it's a decent effort although the singles are by far the standouts here. 3.9/6.